Synthetic peptide conjugated to KLH derived from within residues 450 - 550 of Human SP1, phosphorylated at T453. This antibody gave a positive signal in the following Human whole cell lysates: HeLa and Jurkat. Our Abpromise guarantee covers the use of ab37707 in the following tested applications. WB Use a concentration of 1 µg/ml. Detects a band of approximately 120 kDa (predicted molecular weight: 81 kDa). Transcription factor that can activate or repress transcription in response to physiological and pathological stimuli. Binds with high affinity to GC-rich motifs and regulates the expression of a large number of genes involved in a variety of processes such as cell growth, apoptosis, differentiation and immune responses. Highly regulated by post-translational modifications (phosphorylations, sumoylation, proteolytic cleavage, glycosylation and acetylation). Binds also the PDGFR-alpha G-box promoter. May have a role in modulating the cellular response to DNA damage. Implicated in chromatin remodeling. Plays a role in the recruitment of SMARCA4/BRG1 on the c-FOS promoter. Plays an essential role in the regulation of FE65 gene expression. In complex with ATF7IP, maintains telomerase activity in cancer cells by inducing TERT and TERC gene expression. Up-regulated in adenocarcinomas of the stomach (at protein level). Phosphorylated on multiple serine and threonine residues. Phosphorylation is coupled to ubiquitination, sumoylation and proteolytic processing. Phosphorylation on Ser-59 enhances proteolytic cleavage. Phosphorylation on Ser-7 enhances ubiquitination and protein degradation. Hyperphosphorylation on Ser-101 in response to DNA damage has no effect on transcriptional activity. MAPK1/MAPK3-mediated phosphorylation on Thr-453 and Thr-739 enhances VEGF transcription but, represses FGF2-triggered PDGFR-alpha transcription. Also implicated in the repression of RECK by ERBB2. Hyperphosphorylated on Thr-278 and Thr-739 during mitosis by MAPK8 shielding SP1 from degradation by the ubiquitin-dependent pathway. Phosphorylated in the zinc-finger domain by calmodulin-activated PKCzeta. Phosphorylation on Ser-641 by PKCzeta is critical for TSA-activated LHR gene expression through release of its repressor, p107. Phosphorylation on Thr-668, Ser-670 and Thr-681 is stimulated by angiotensin II via the AT1 receptor inducing increased binding to the PDGF-D promoter. This phosphorylation is increased in injured artey wall. Ser-59 and Thr-681 can both be dephosphorylated by PP2A during cell-cycle interphase. Dephosphorylation on Ser-59 leads to increased chromatin association during interphase and increases the transcriptional activity. On insulin stimulation, sequentially glycosylated and phosphorylated on several C-terminal serine and threonine residues. Acetylated. Acetylation/deacetylation events affect transcriptional activity. Deacetylation leads to an increase in the expression the 12(s)-lipooxygenase gene though recruitment of p300 to the promoter. Ubiquitinated. Ubiquitination occurs on the C-terminal proteolytically-cleaved peptide and is triggered by phosphorylation. Sumoylated by SUMO1. Sumoylation modulates proteolytic cleavage of the N-terminal repressor domain. Sumoylation levels are attenuated during tumorigenesis. Phosphorylation mediates SP1 desumoylation. Proteolytic cleavage in the N-terminal repressor domain is prevented by sumoylation. The C-terminal cleaved product is susceptible to degradation. O-glycosylated; contains at least 8 N-acetylglucosamine side chains. Levels are controlled by insulin and the SP1 phosphorylation states. Insulin-mediated O-glycosylation locates SP1 to the nucleus, where it is sequentially deglycosylated and phosphorylated. O-glycosylation affects transcriptional activity through disrupting the interaction with a number of transcription factors including ELF1 and NFYA. Also inhibits interaction with the HIV1 promoter. Inhibited by peroxisomome proliferator receptor gamma (PPARgamma). Nucleus. Cytoplasm. Nuclear location is governed by glycosylated/phosphorylated states. Insulin promotes nuclear location, while glucagon favors cytoplasmic location. 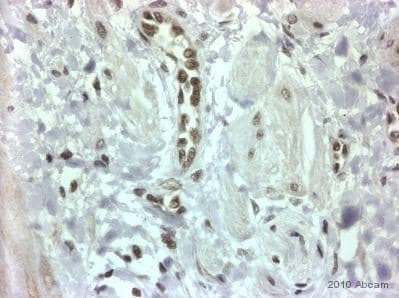 ab37707, at a 1/2000 dilution, staining human SP1 (phospho T453) in colon cancer tissue by Immunohistochemistry, Formalin fixed Paraffin embedded tissue. 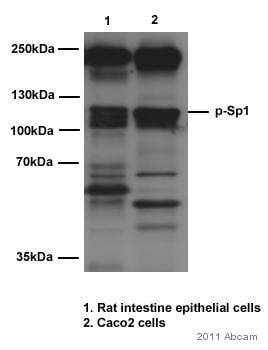 Western blot - Anti-SP1 (phospho T453) antibody (ab37707)Image courtesy of Liwei Xie by Abreview. Publishing research using ab37707? Please let us know so that we can cite the reference in this datasheet. Why the antibody show band at 250 kDa? We are not sure about the identity of 250kDa band- it's interesting that some other vendors abs also show same additional band. I have blasted the immunogen sequence against Human, the immunogen is specific for just the target protein so I couldn't get any ideas from that. I also had a quick look in the literature and unfortunately I couldn't find anything to explain what the 250 kDa might be. I think it's probably non-specific but the only way to be sure would be to sequence the protein. I hope this information is nevertheless helpful to you. Please do not hesitate to contact us if you need any more advice or information. For your convenience, I have also attached it to this email as pdf-file. I am sorry that the antibody is giving additional bands. Please let me know if these tips are of help, or not. I look forward to hear back from and wish you good luck with your experiments. Non-specific bands in WB with rat tissue lysates. Thank you for your call today and for letting us know about the trouble with this antibody. As we discussed, I'm sending a free of charge vial of ab59257 on the order ***, which should arrive on Monday. Please keep me updated about the results using this replacement antibody, and let me know if there is anything else that we can do for you. I am looking into buying one of your Sp1 phosphoT453 antibody (ab37707 or ab59257). None of them have been reviewed for western blot which is what we want to use it for. I am confused by the size of products that you show on the western blot for ab37707.....In Hela cells (and most other cell types), Sp1 runs at 80-90Kda, (as shown with your other Sp1 antibody ab77441) yet the products recognized with that antibody appear much higher. SP1 has a number of glycosylation sites and so this is probably the reason why we see a difference between the expected MW (80-90kDa) (ab59257) and the observed (120kDa) in our product ab37707. We have run ab37707 alongside ab59257. No information was shown to suggest the 120kDa band was non-specific, but for ab59257 we observed a band in Jurkat cells comparable to the 120kDa band we see in ab37707. There is also a difference between the target band in HeLa and Jurkat. We cannot predict which glycosylated form(s) will be present in the lysate used, and so this is likely to be the reason for the difference observed. We have also carried out a peptide block, the data of which is on the datasheet and shows that the 120kDa is quenched by the immunising modified peptide and not by the non-modified peptide.